16511 EP NIUAFO'OU (TIN CAN ISLAND) (1983) Map of Island*. 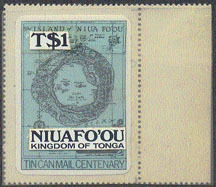 Some kind of mockup proof of Tonga Tin Can Centenary stamp with overlay for overprint and surcharge for Niuafo'ou. Scott Type A1. 4596 EP NIUAFO'OU (Tin Can Island) (1984) Humpback Whale*. Cromalin proof in full color on thick cardboard, from the printer's archives. Only 2-3 exist! Scott No 44, Yvert No 44. Beautiful and very rare! 10563 EP NIUAFO'OU (TIN CAN ISLAND) (1984) Humpback Whale*. Cromalin proof in full color on thick cardboard, from the printer's archives. Only 2-3 exist! Scott No 44, Yvert No 44. Beautiful and very rare! 15034 EP NIUAFO'OU (Tin Can Island) (1985) Natives preparing kava*. Cromalin proof in full color from the printer's archives. Kava is an alcoholic drink prepared from the kava shrub and widely used in Polynesia. Scott No 52, Yvert No 51. Only 2-3 exist. Very rare! 10663 EP NIUAFO'OU (Tin Can Island) (1988) Plane*. Doctor*. Imperforate color proof mounted on cardboard, from the printer's archives. Flying doctor service. Bicentenary of Australia. Scott No 98i, Yvert No BF7. Scarce! 10172 EP NIUAFO'OU (Tin Can Island) (1989) Viper Fish*. Cromalin proof in full color from the printer's archives. Scott No 106, Yvert No 118. Only 2-3 exist. Very rare! 10173 EP NIUAFO'OU (Tin Can Island) (1989) Angler Fish*. Cromalin proof in full color from the printer's archives. Scott No 107, Yvert No 119. Only 2-3 exist. Very rare! 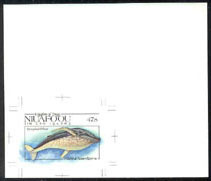 10557 EP NIUAFO'OU (Tin Can Island) (1989) Snipe Eel*. Cromalin proof in full color from the printer's archives. Scott No 105, Yvert No 116. 11823 EP NIUAFO'OU (Tin Can Island) (1989) Volcans*. Plumet de lave*. Épreuve progressif non dentelé avec les couleurs bleu et jaune, séries origines de la Terre. Yvert No 108, Scott No 110. Très beau! 11824 EP NIUAFO'OU (Tin Can Island) (1989) Volcans*. Plumet de lave*. Épreuve progressif non dentelé avec le couleur bleu, séries origines de la Terre. Yvert No 108, Scott No 110. Très beau! 11866 EP NIUAFO'OU (Tin Can Island) (1989) Ocean*. Progressive imperforate proof pair from printer's archive. Evolution of Earth series - Formation of the Oceans. Scott No 112, Yvert No 110. Not easy to find! 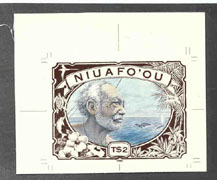 4597 EP NIUAFO'OU (Tin Can Island) (1990g) Whale swamping native canoe*. Turtle*. Bird*. Dolphin*. Cromalin proof in full color on thick cardboard, from the printer's archives. Only 2-3 exist! Scott No 130, Yvert No 130: Polynesian whaling. Lovely and very rare! 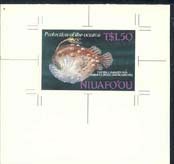 4598 EP NIUAFO'OU (Tin Can Island) (1990g) Whale diving*. Turtle*. Bird*. Dolphin*. Cromalin proof in full color on thick cardboard, from the printer's archives. Only 2-3 exist! Scott No 131, Yvert No 131: Polynesian whaling. Lovely and very rare! 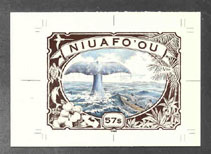 4599 EP NIUAFO'OU (Tin Can Island) (1990h) Whale*. Porpoise*. Turtle*. Bird*. Flowers*. Cromalin proof in full color on thick cardboard, from the printer's archives. Only 2-3 exist! Scott No 132, Yvert No 132: Polynesian whaling. Lovely and very rare! 11867 EP NIUAFO'OU (Tin Can Island) (1990) Lake Vai Lahi*. Imperforate monochrome proof of strip of 3 stamps, printed as a continuous design. Scott No 124, Yvert No BF9. Hard to find! 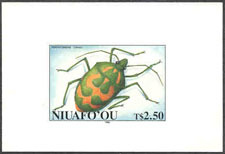 4486 EP NIUAFO'OU (Tin Can Island) (1991) Ceresium Beetle*. Cromalin proof in full color. Scott No 141, Yvert No 140. Note that the value was changed to 57s on the final stamp! Only 2-3 cromalin proofs were made. Very rare! 4487 EP NIUAFO'OU (Tin Can Island) (1991) Ceresium Beetle larva*. Cromalin proof in full color. Scott No 142, Yvert No 141. Note that the value was changed to 42s on the final stamp! Only 2-3 cromalin proofs were made. Very rare! 5650 EP NIUAFO'OU (Tin Can Island) (1991) Coconut palm*. Eel*. Young girl*. Boy*. 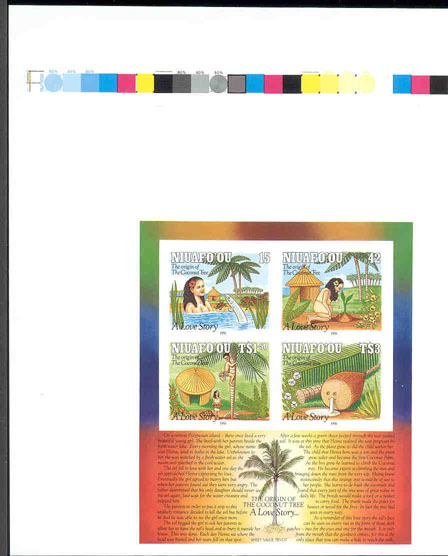 Imperforate plate proof of minisheet Legend of the Origin of the Coconut Tree. Tells the story of the love between the eel and the maiden Heina that led to the first coconut tree. These proofs were produced from the printer's archives. Scott No 146, Yvert No BF12. Fascinating! 10446 EP NIUAFO'OU (Tin Can Island) (1991) Beetles*. 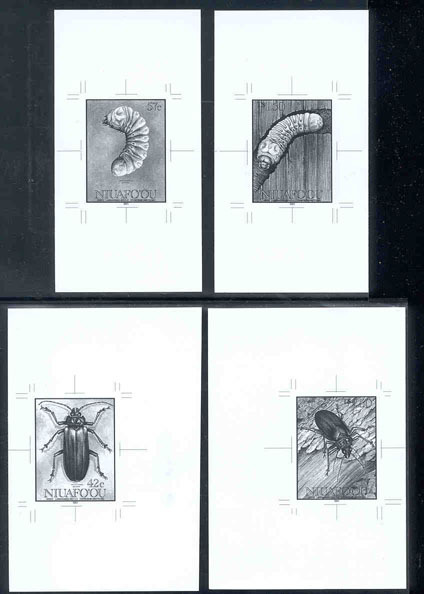 Complete set of 4 monochrome proofs from the printer's archives. These types of proofs were sent between artist, designer and printer until the design was finalized. Only a limited number were produced and the final designs were placed with archival material. This is evidently a preliminary set, as the 42s and 57s images are switched! Scott Nos 140-31, Yvert Nos 140-3. Scarce! 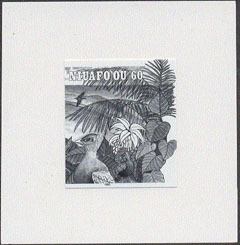 6701 EP NIUAFO'OU (Tin Can Island) (1993) Megapode*. Monochrome proof of last stamp of strip of 5. Scott No 163e, Yvert No 197. 11825 EP NIUAFO'OU (Tin Can Island) (1993) Volcano erupting*. Crater lake*. Beetle grubs*. Megapode*. 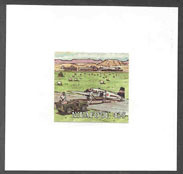 Strip of 3 imperforate proofs in full color. Scott No 164, Yvert Nos 198-9. Lovely! 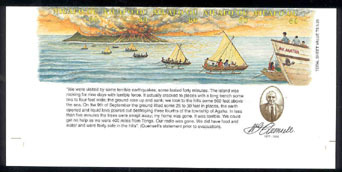 2328 EP NIUAFO'OU (TIN CAN ISLAND) (1994) Sailing ships: HMS Bounty*, HMS Pandora*, whaling ship*, trading schooner*. Imperforate plate proof strip of 5. Scott No 172. Yvert No 209. 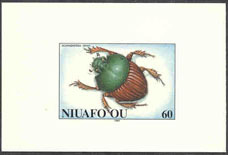 4494 EP NIUAFO'OU (Tin Can Island) (1994a) Scarabaeidea beetle*. Cromalin proof in full color on heavy cardboard. Scott No 168, Yvert No 202. Only 2-3 were made. Gorgeous! 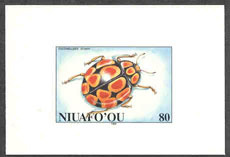 4495 EP NIUAFO'OU (Tin Can Island) (1994b) Coccinellidea beetle*. Cromalin proof in full color on heavy cardboard. Scott No 169, Yvert No 203. Only 2-3 were made. Beautiful! 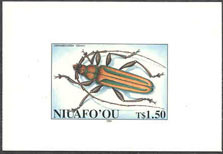 4496 EP NIUAFO'OU (Tin Can Island) (1994c) Cerambycidea beetle*. Cromalin proof in full color on heavy cardboard. Scott No 170, Yvert No 204. Only 2-3 were made. Lovely! 4497 EP NIUAFO'OU (Tin Can Island) (1994d) Pentatomidea beetle*. Cromalin proof in full color on heavy cardboard. Scott No 171, Yvert No 205. Only 2-3 were made. Fantastic! 11827 EP NIUAFO'OU (Tin Can Island) (1996) Volcanic eruption*. Imperforate plate proof of strip of 5 from printer's archives. Lengthy story of evacuation of island printed below. Scott No 192. Fantastic!